Five years ago, I left my home in South America and came to the UK to work as an AVS volunteer. My friends were astonished. Five years ago, I left my home in South America and came to the UK to work as an AVS volunteer. My friends were astonished. They knew I loved mission work, but I guess they expected me to go to a remote village in a developing country. Frankly, I had the same picture in mind when I first started praying and planning. However, God made it clear that He wanted me in the UK, so I came. Even though I was in my mid-twenties then, I had never lived on my own. Back home, most universities do not have student housing. Since renting a flat was far beyond my means, I finished my degree and found my first professional job while lodging in my tiny pink bedroom at my parents’ house. Despite my lack of exposure to life outside home, I was optimistic about traveling overseas. I figured that my being adventurous and fluent in English would prevent me from having a hard time adapting. While it certainly helped, it was not quite enough. There is a reason why they say that you can take the girl out of South America, but you can’t take South America out of the girl. Every culture is like a gigantic pastry-cutter that shapes our views in a unique manner. Remarkably, we are aware of only some of the areas of our cultural shape. We see the tip of the iceberg, but beneath the surface, there is a colossal mass of traditions, prejudices and values that govern us. Simply put, I was a ticking bomb. A culture clash was waiting to happen and it was only a matter of time before it did. A tsunami of misunderstandings occurred. At work, at church, even while talking with friends, I seemed to keep annoying people without even knowing how. To adapt, I needed to become aware of my own cultural preconceptions and learn how to transform my thinking. It was a daunting task. The hardest part, however, was redefining my view of God. Perhaps in an attempt to identify with Him, or maybe out of sheer ethnocentrism, we tend to intuitively dress God in the ‘traditional costume’ of our own culture. The most tangible evidence of this tendency is the way we picture Jesus. I have a small collection of pictures of Jesus from different countries; it includes an African Jesus, an Asian Jesus, and a European Jesus. Our tendency to customize God is not limited to appearances. Years ago, while visiting Peru, I found myself in the magnificent Cusco Cathedral. A picture of the Last Supper immediately got my attention. “Can you recognize what the disciples are eating?” the tour guide asked me. When I gave up guessing he said, “It is vizcachá,” which is a South American rodent similar to a rabbit. The artist, Marcos Zapata, also portrayed the disciples drinking Chicha, a traditional beverage made from fermented corn, and finished his masterpiece by ensuring that Judas’ face resembled that of Fransisco Pizzaro, the Spanish conqueror who murdered the Inca emperor, Atahualpa. Unapologetically, Zapata painted a Peruvian Last Supper. Moving abroad was like looking at that painting again, only inside of me. It made me wonder how much of my view of God had originated in my background, and how much had originated in God Himself. More importantly, I wondered if I could tell God and tradition apart. I wanted to be sure to avoid both acculturation and ethnocentrism. At the beginning, even considering simple issues like worship styles filled me with anxiety (e.g. I nearly had a panic attack when I saw drums in a church). But time helped me to stop scratching the surface and start reconsidering my core view of God. Shockingly, I realized that I was ruled by guilt. While paying lip-service to grace, I treated God like Santa, as though I needed to be a good girl to get Him to like me. The strong emphasis on behavior from my culture had blurred all practical knowledge of grace to the point where religion became a daily guilt trip. I was enslaved for so long that when grace found me, I was tempted to feel guilty for all those years of guilt. How could I have misunderstood God so much and yet call myself a Christian? With this question still echoing in my mind, God reminded me of the story of the journey to Emmaus. The story tells of the resolution of a cultural misunderstanding of epic proportions. Walking to Emmaus, the disciples were both depressed and puzzled because they were trying to make sense of two seemingly opposite realities – that Jesus had claimed to be the Redeemer, and that He had died shamefully on a cross. It would be easy for us, after two thousand years of cultural reinterpretation, to condemn the disciples for not seeing that Christ was meant to suffer and die, but they were in a quandary. Their culture had taught them to expect an anointed king who would bring freedom from Rome. This expectation tainted the way they understood prophesy and interpreted Jesus’ actions. Logically, they were shocked when He died. But on the road to Emmaus, the risen Savior walked next to his culturally-blinded disciples and reinterpreted the prophecies to them. Then, and only then, they began to understand. I identified so much with the disciples’ experience that their story became my prayer. I would get on my knees and say: “Lord, walk to Emmaus with me too. Please come and teach me who You really are, beyond culture and prejudices.” I found that truth sets you free when you let go and give God permission to change anything and everything about you. It is not a one-day job; breaking free from cultural assumptions takes time. But the road to Emmaus is worth traveling. If you become an AVS volunteer you may experience some cross-cultural misunderstandings just like I did. Don’t panic; this is perfectly normal. Instead, remember that this could become the most exciting learning experience of your life. Culture has the ability to be everywhere and remain unseen; but Jesus can expose it and teach you where changes are needed. Perhaps moving abroad will show you that you are culturally biased with regard to your body image, your idea of success and happiness, or even your ideas about God. Whatever it is, Jesus will show you and He will remain with you all the way. As Oswald Chambers wisely wrote, “Men pour themselves into creeds, and God has to blast them out of their prejudices before they can become devoted to Jesus Christ.”** But when we finally abandon ourselves to Him, there is no limit to the love and freedom that we shall enjoy. 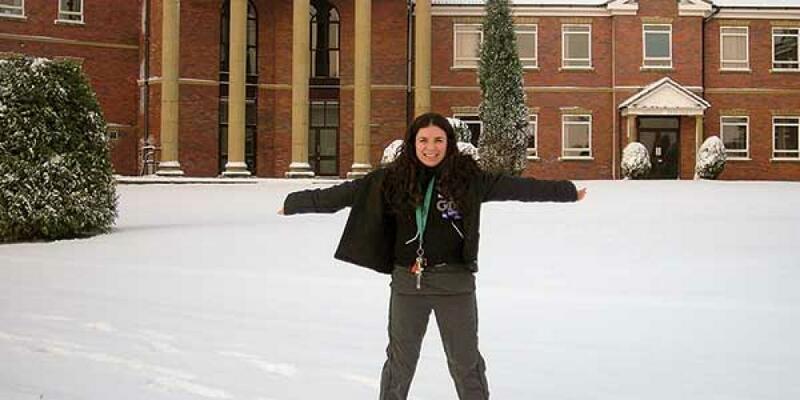 Vanessa Pizzuto, originally from Argentina, served as a Librarian for Stanborough Secondary School in the United Kingdom. She served from April of 2007 to July of 2008. While pursuing further education, Vanessa now works for Stanborough Secondary School as the Exchange Program Manager. She feels that volunteering with AVS was a life-changing experience that allowed her to grow spiritually and emotionally. She hopes that everyone reading her article will be inspired to be a part of the AVS program!